Over at Craftown they’re already thinking about Christmas (and I heard yesterday some stores are already selling Christmas stuff), so if you’re ready to start your holiday crafting you might want to take a look at these knit gift card holders from Melanie Smith, which are so cute you could hang them on the tree until it’s time to open them. Of course, if you’re thinking this far ahead you probably aren’t buying anyone gift cards, but file this one away for your last-minute shopping. Or knit the holders now knowing your gift will look cuter than just a gift card when the time comes. 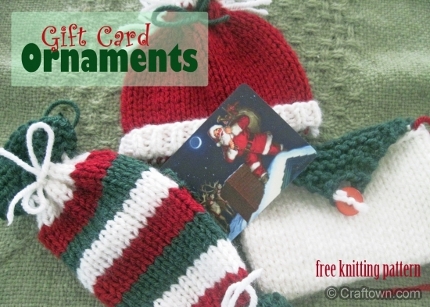 You could also use the basic envelope or tube shape to jazz up a gift card any time of year, just knit in different colors.